Comments: The poster provides a simple message in a hard to miss red poster with big letters. 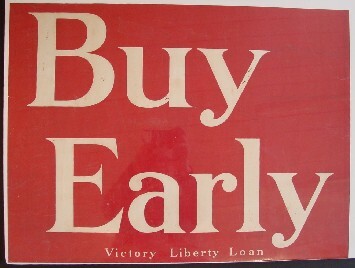 Buying government war bonds early and often was the conduct sought to be encouraged by this World War One poster. It would be a great patriotic sign for a retail merchant who wants customers to purchase before the Christmas rush or real estate agents who want to encourage customers to buy before interest rates or prices rise. Condition: Very good, shrink wrapped, one repaired tear.